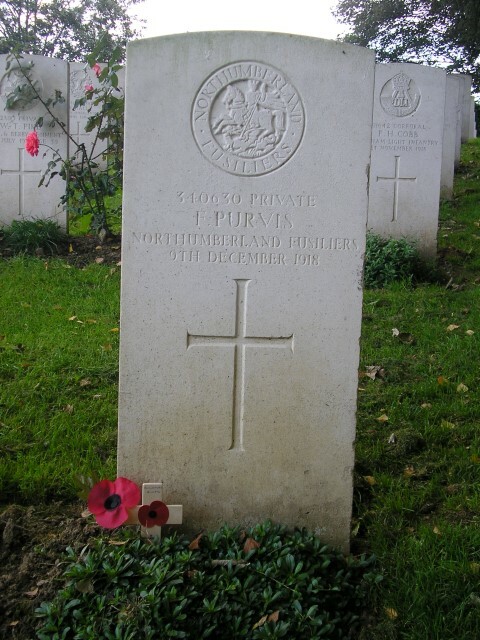 340630 Private Fred Purvis, 1/5th battalion, the Northumbrian Fusiliers died 9 December 1918 and is buried at Niederzwehren Cemetery near Kassel, Hessen, Germany. He is commemorated on Evenwood War Memorial and the Roll of Honour, St. Paul’s Church, Evenwood. In 1901, the Purvis family lived at Stones End where George worked as a colliery banksman. 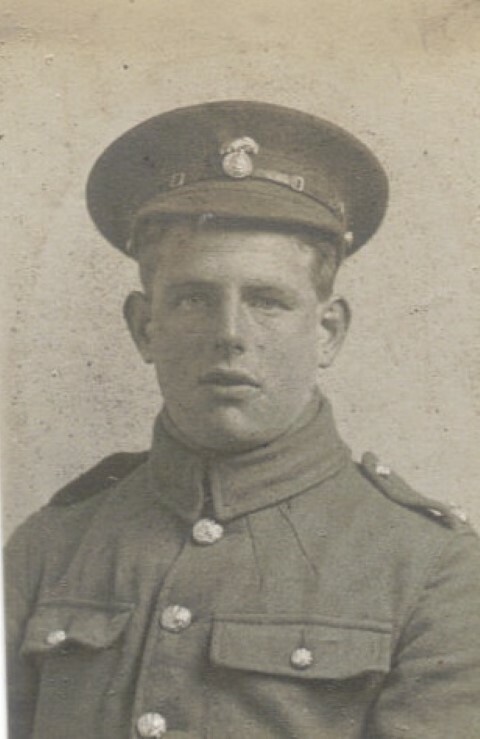 Fred Purvis enlisted 22 June 1916 at Bishop Auckland joining the Northumberland Fusiliers. He entered France 21 April 1918. He joined 1st/5th Battalion, the Northumberland Fusiliers. 5 March: It is possible that he was training during this time, but the need for men was so great that nearly two years training seems improbable. It is possible that Fred was classed as unfit to go to the front until the need for men was so great that they had to send him. Fred sent a postcard to his sister Alice of the Zeppelin attack on Hull in 1915. He appears to be staying with his elder foster brother Will who lived in Hull. Fred has written on the postcard that he would like Alice to send him some money if she can spare it and to remember him to his pal at Cragwood. Alice died 15 May 1918 in the `flu pandemic that claimed more lives than the war. Another postcard is of a sentry in Flanders sent to Edith after he had gone to war. The Northumberland Fusiliers saw much action in France and Flanders. To discover what happened to the 1/5 Northumberland Fusiliers on the Western Front in Spring 1918 when Fred went to France it is necessary to look at the War Diaries. 21 March 1918: General von Ludendorff launched an offensive which was intended to bring victory to the German forces on the Western Front. His aim was to drive the British from the Somme to the Aisne, then to threaten Paris. It was looking good for Germany, Russia was out of the war and the German division on the Eastern Front were being moved west. Ludendorff`s attack was unexpected (Haig expected it to be further south), artillery bombardment was long and heavy. With intense fighting the German army pushed on at an alarming rate with British forces retreating to the Somme. Paris was bombarded with specially manufactured guns from 74 miles away. At the end of March the French and British held and halted the German advances only 50 miles from Paris. Then the tide was turned by a counter attack by British, Australian and Canadian troops. When the battle closed on 5th April Germany had taken 90,000 prisoners, however their own casualties were 250,000 compared to 240,000 allied casualties. 100,000 infantry replacements were sent from Britain many only 18 or 19 years old and had never seen action before. The poverty and ill-health of many industrial workers in pre-war Britain meant that many men failed to reach the minimum health requirements for military service. In some areas as many as 70% of men were classified as unfit for overseas duties, by 1918 the manpower situation was serious and the bottom of the barrel scraped sending many men to France who would otherwise not have gone. 9 April 1918: Ludendorff launched his second offensive and a storm of gas and high explosive shells tore into the Allies, the British were pressed backwards and Haig issued his famous `Backs to the wall` order. Telling men to fight and die where they stood, the freedom of mankind depended on it. The attack ran out of steam as the German troops were exhausted, their guns short on ammunition and depressed by the resistance they were meeting. There was a lull at the end of April beginning of May. By April 1918 the Division was much depleted and set to work to rebuild its decimated ranks. Reinforcements arrived made up largely of youths and inexperienced men: this is when Fred is sent to the front. The Division was in the Roquetoire area but received orders to move to the area of the Sixth French Army on the Aisne, they had been warned that they probably would go to the front line about 5 May. The following days were quiet and the men were working on improving trenches, resting and cleaning up. No Man`s Land was very quiet. 25 May: 8/DLI raided the enemy and brought back a wounded prisoner who provided them with vital information. At 11am on the 26th of May news was received at Divisional Headquarters of a suspected German attack on the morning of the 27th; preliminary bombardment to begin at 1am followed by infantry assault with tanks at 4.30am. The war diaries describe clearly the run up to May 27th and give detailed account of the first day of the Battle of the Aisne: the day that Fred was posted missing. The picture is of a terrible battle with “intense barrage” and “heavily shelled” repeated every other line. The loss was so great that by the end of May the Division could only muster 700 fit infantrymen. “Fred died on the 9th December 1918 at Quedlinburg, Germany received letter from War Office on 12th May 1919”. “The rations that the Germans gave us were rye and potato bread, divided into five sections and shared by five men. Food was so precious that we made a little balance with a piece of cardboard and string on a stick to weigh it, so that one man didn’t get a thick slice or a thin slice. We got the food the night before for the next day, so if you ate the bread straight away you went hungry. We also had a variety of mangel-wurzel soup, cooked in a big cauldron on a fire in the compound. We used to say, “Come on stir the bloody pot up” so that we might get something solid from to eat from the bottom”. Germany was exhausted by the war as all resources had been marshalled for the war effort. There would be little food, clothing or medicine for prisoners. Owing to their weakened state men were vulnerable to disease. Most died from their wounds, nearly as many died from pneumonia, some died of starvation, dysentery, tuberculosis and typhus. Fred’s cause of death is not known. The details of his death remain unknown but there was the great flu pandemic raging across Europe throughout the summer of 1918 so perhaps he eventually succumbed to pneumonia. “Quedlinburg lies just below the Harz Mountains in Saxony and about 30 miles South West of Magdeburg. This is where Frederick Lavender died as a prisoner of war. He is not listed among those held prisoner in Germany in 1916 but this does not necessarily mean that he was not captured before that date. 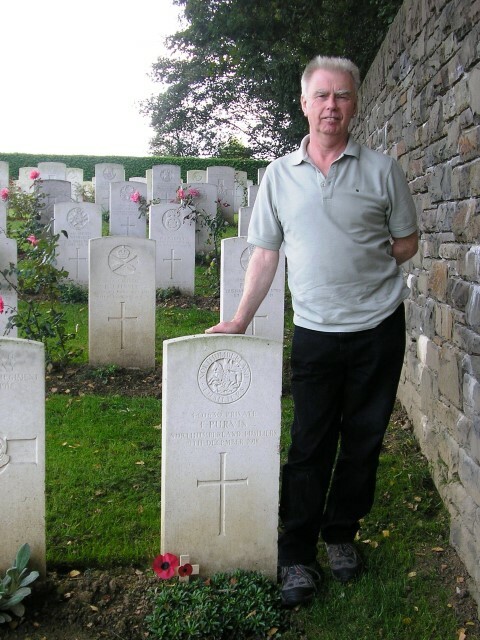 Private Fred Purvis’ official date of death is the 9 December 1918. Private F. Purvis was awarded the British War and Victory medals. 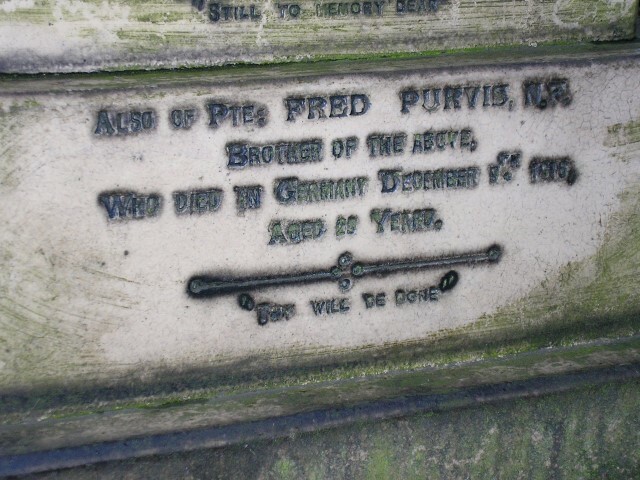 Private Fred Purvis is buried at grave reference VIII. E. 19 Niederzwehren Cemetery, Germany. The cemetery is located 10km south of Kassel in the region of Hessen, Germany. The cemetery was begun by the Germans in 1915 for the burial of prisoners of war who died at the local camp. During the war, almost 3,000 Allied soldiers and civilians including French, Russian and Commonwealth, were buried there. In 1922-23, it was decided that the graves of Commonwealth servicemen who had died all over Germany should be brought together into 4 permanent cemeteries. Niederzwehren was one of those chosen and in the following years more than 1,500 graves were brought into the cemetery from 190 burial grounds in Baden, Bavaria, Hanover, Hessen and Saxony. Private Fred Purvis died at Quedlinburg POW Camp so presumably was buried at the camp cemetery then re-interred at Niederzwehren.